The populism/anti-populism frontier and its mediation in crisis-ridden Greece: from discursive divide to emerging cleavage? Along with other South-European countries, since 2008, Greece has experienced deep economic and social dislocation, leading to a crisis of representation and triggering populist mobilisations and anti-populist reactions. This article focuses on the antagonistic language games developed around populist representations, something that has not attracted much attention in the relevant literature. 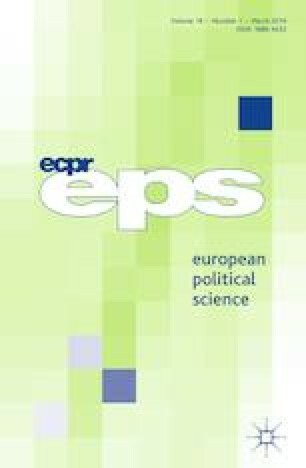 Highlighting the need to study anti-populism together with populism, focusing on their mutual constitution from a discursive perspective, it articulates a brief yet comprehensive genealogy of populist and anti-populist actors (parties and media) in Greece, exploring their discursive strategies. Moving on, it identifies the main characteristics this antagonistic divide took on within the newly contested, crisis-ridden sociopolitical field, highlighting the implications for a contemporary understanding of cleavages, with potentially broader implications. This article draws on the conclusions of the POPULISMUS research project (www.populismus.gr), which was undertaken at the Aristotle University of Thessaloniki (2014–2015), with funding from the European Union (European Social Fund) and National Funds (Greece) within the framework of the Operational Programme ‘Education and Lifelong Learning’ (Action ‘ARISTEIA II’). Giorgos Katsambekis wishes to thank the Research Committee of the Aristotle University of Thessaloniki (https://www.rc.auth.gr/) for its generous support through the ‘Excellence Scholarship’ for postdoctoral researchers (2016). Coutifaris, K.V. 2017. Populism, the apolitical dogma that is based on lies. Ekathimerini.com, March 30, www.kathimerini.gr/902952/opinion/epikairothta/politikh/laikismos-apolitiko-dogma-poy-sthrizetai-sto-yema. Accessed 20 Oct 2017 (in Greek). Hope, K. and S. Wagstyl. 2015. Greece will no longer deal with “troika”, Yanis Varoufakis says. Ft.com, January 30, https://www.ft.com/content/2403f3e8-a8a4-11e4-97b7-00144feab7de. Accessed 20 Oct 2017. Hloušek, V. 2010. European integration as a party cleavage? A conceptual debate. http://cepsa.at/ablage/2011/paper_hlousek.pdf. Accessed 20 Oct 2017. Hüetlin, T. and A. Neubacher. 2015. Greek Finance Minister Varoufakis: “Austerity Has Done Nothing to Solve Greece’s Problems”. Spiegel online, February 16, 2015, www.spiegel.de/international/europe/interview-with-greek-finance-minister-giannis-varoufakis-a-1018443.html. Accessed 20 Oct 2017. Kioupkiolis, A., and F. Seoane Pérez. 2018. Reflexive technopopulism: Podemos and the search for a new left-wing hegemony. In Populist discourses and political communication in Southern Europe, symposium, ed. S. Salgado, and Y. Stavrakakis. European Political Science. https://doi.org/10.1057/s41304-017-0140-9. Kroustali, D. 2016. How are they building the SYRIZA regime. Tovima.gr, March 6, http://www.tovima.gr/politics/article/?aid=782263. Accessed 20 Oct 2017 (in Greek). Mitsotakis, K. 2016a. Statement of the newly elected president of New Democracy. New Democracy, January 11, http://nd.gr/nea/dilosi-toy-neoeklegentos-proedroy-tis-neas-dimokratias-k-kyriakoy-mitsotaki. Accessed 20 Oct 2017 (in Greek). Mitsotakis, K. 2016b. Mitsotakis slams populism, vows to fight electoral change. Ekathimerini.com, June 29, www.ekathimerini.com/210006/article/ekathimerini/news/mitsotakis-slams-populism-vows-to-fight-electoral-change. Accessed 20 Oct 2017. Pappas, T. 2015. Populist hegemony in Greece. Open Democracy, 25 September, www.opendemocracy.net/can-europe-make-it/takis-s-pappas/populist-hegemony-in-greece. Accessed 20 Oct 2017. Papadopoulos, P. 2016. Alexis Tsipras: The “little guy” that wants to become an emperor. Tovima.gr, June 26, http://www.tovima.gr/politics/article/?aid=810626. Accessed 20 Oct 2017 (in Greek). Salgado, S., and Y. Stavrakakis. 2018. Introduction: Populist discourses and political communication in Southern Europe. In Populist discourses and political communication in Southern Europe, symposium, ed. S. Salgado, and Y. Stavrakakis. European Political Science. https://doi.org/10.1057/s41304-017-0139-2. Salgado, S. 2018. Where’s populism? Online media and the diffusion of populist discourses and styles in Portugal. In Populist discourses and political communication in Southern Europe, symposium, ed. S. Salgado, and Y. Stavrakakis. European Political Science. https://doi.org/10.1057/s41304-017-0137-4. Samaras, A. 2016. Samaras: ND united to win the battle against populism. Ekathimerini.com, January 11. http://www.kathimerini.gr/845238/article/epikairothta/politikh/samaras-h-nd-enwmenh-na-kerdisei-th-maxh-kata-toy-laikismoy. Accessed 20 Oct 2017 (in Greek). Spiegel, P. 2015. Greece’s leader warns Merkel of “impossible” debt payments. Ft.com, March 23, 2015, https://www.ft.com/content/ae9d0cb8-d0b5-11e4-982a-00144feab7de?ftcamp=published_links%2Frss%2Fbrussels%2Ffeed%2F%2Fproduct#axzz3V70Sdj6A. Accessed 20 Oct 2017. Veremis, T. 2017. Eleftherios Venizelos and populism. Ekathimerini.com, February 19. http://www.kathimerini.gr/896977/opinion/epikairothta/politikh/eley8erios-venizelos-kai-laikismos. Accessed http://www.kathimerini.gr/845238/article/epikairothta/politikh/samaras-h-nd-enwmenh-na-kerdisei-th-maxh-kata-toy-laikismoy (in Greek).